What will Brexit mean for Export Security? Britain's exit from the EU has officially been extended to 31st October 2019 and it's important to know of any changes to regulation that may affect the security process of importing and exporting goods. These long delays may have significant consequences for transport and logistics crossing the border. Many import goods consist of perishables and time-sensitive products like food and medicine, which require expedited movement to their destination. However, another consideration is the security of this cargo as the long delays at ports may leave it vulnerable for intruders to breach it, long before it can be discovered. Tamper evident and resistant seals should therefore be considered an absolute necessity to securing goods in transit in order for made as difficult to breach as possible, whilst also providing clear evidence of tampering if necessary. Mechanical Testing to determine a security seals physical strength (Clause 5). “H” Class Security Seals or High Security Seals are manufactured to the highest standards and are marked with a “H” on the seals body. 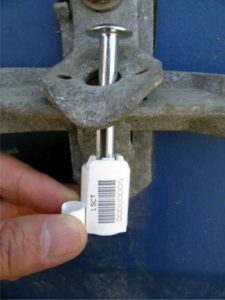 The most popular high security seals are bolt seals and cable seals. In May 2014, new requirements were published for ISO 17712:2013, for all security seals to be compliant, they must be categorized and marked “H” as High Security Seals. When undergoing mechanical testing by an independent ISO 17025 accredited laboratory (Clause 5) and the manufacturer must be certified to both ISO9001 and ISO17712: Annex A. Seals be designed and constructed with tamper indicative features that generate tell-tale evidence of tampering (Clause 6). The new requirement for High Security Seals also states that the security seal must also be compliant with Clause 6: Evidence of Tampering. Clause 6 requires the manufacturer to have a documented and audited process and test specification in place in its quality manual for all High Security Seals in its product range. Clause 6 is a valuable addition to the seal standard emphasizing the importance of continuous improvement of tamper resistance and tamper indicating features on security seals. If a High Security Seal is only presented to you with a clause 5 certificate or just a clause 6 certificate then it does not have the “H” classification, which means it is not a High Security Seal. We supply many ISO 17712 C-TPAT security seals to businesses around the globe, all of which conform to international transport standards. Below are some of our most popular high-security seal options, however we can also design and build to specific requirements. Neptuneseal – The Neptuneseal is a bolt seal, compliant with high security international standard ISO 17712:2013 and specifically with the requirement of having the internal metal part exceeding 18 mm. The patent pending innovative mechanical design is characterised by two metal tabs attached to the bolt, which securely slot into the locking channel, thus preventing any breaching by high speed spinning of the female part of the seal. Any tampering attempt will give evidence of irreparable damage onto the bolt seal. Cable Seals – Cable Seals are classed as a barrier seal, which is a variable length cable security seal, and provides a high level of security through its unique locking mechanism and cable design. Cable seal is 300mm x 2.5mm (LxD), and has successfully passed the stringent ISO 17712:2010 test to qualify as HIGH security and C-TPAT compliant seals. Ballseal – Metal Ballseals are extremely durable, providing secure protection for shipments in transit. It is a reliable and immediate indicator that goods have been received as sent. The seal features a locking mechanism totally enclosed in the head, which is secured by two independent spring rings. The seal is applied without the need of tools and is fully compliant with ISO PAS 17712. Forkseal – The Forkseal provides complete wrap-around protection of container locking bars of any size. The supplied seal plates and bolt seal can be fitted at an appropriate section of the fork. The seal provides a high-level of physical strength – the strong steel can only be cut at the designated cutting point. The seal resists manipulation and substitution with numbering replicated on the pin and fork bar. Get discount prices and more.